I have been photographing the sky forever. I have copious amounts of sunrises, sunsets, and sun rays peeking out of clouds as if heaven itself was made visible. I have the suns rays illuminating fog, reflecting off water and creating great and wonderful shadows. But this little tuxedo kitty is my sunshine. She showed up one day in my magnolia tree out front and refused to leave. 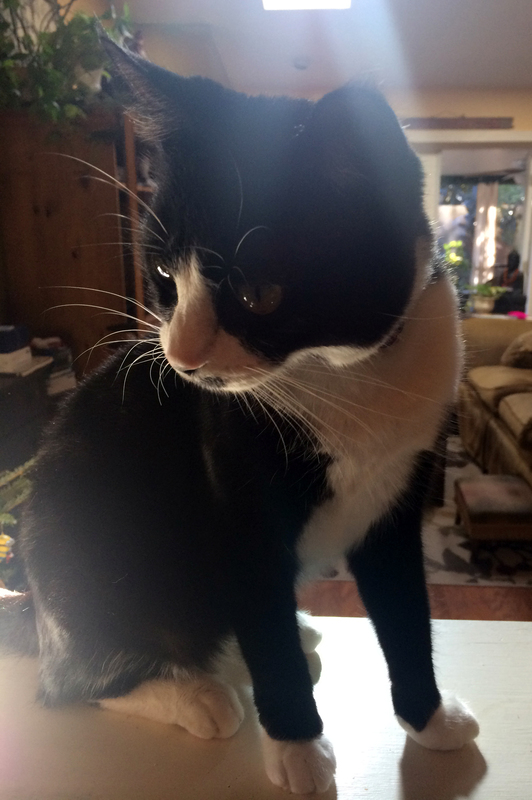 Here she is perched above the kitchen sink – where she’s not supposed to be – and the sun is streaming through the sky light calling her out. Find more sunshiney photos here. She’s adorable! And how perfect that the sun is shining around her like that! Thanks! I have to snap quickly with that one! I have a tuxedo cat, too! Oh, they are most handsome, aren’t they? Congratulations to you! She’s so cute and so much personality!